Note from Editor - More Tribute to Tinplate: Florida hobby and craft designer Howard Lamey has created many projects reminiscent of the illuminated pasteboard houses that brightened North American households during Christmas seasons between 1928 and 1965 (often called "putz" houses from the German word for "puttering around.") This project, however, is a tribute to an even older tradition - the tinplate villages and trains that surrounded so many Christmas trees in the early 1900s. Although Big Indoor Trains™ is contributing lithograph-inspired downloadable graphics for other projects in this series, this project is entirely Howard's design. We are privileged to host the project both at Big Indoor Trains™ and at Howard's web site LittleGlitterHouses.com. 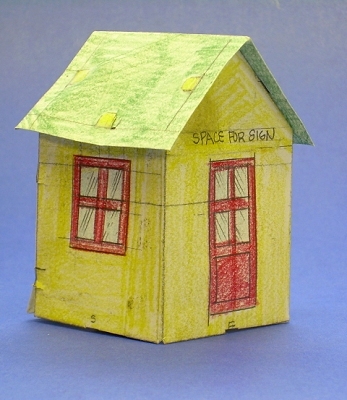 Although one could build these projects from sheet tin, we are making them from cardboard. Ironically, this reflects yet another tradition - when tinplate trains and towns were in vogue, Japanese companies manufactured heavily-shellacked cardboard houses and stations that you could use to supplement your empire. 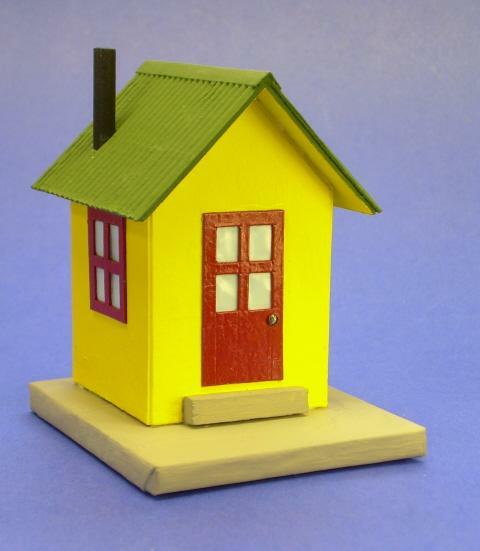 Today putz house collectors call these old Lionel and Ives-inspired cardboard houses "Lackies," because of the lacquer that made them almost as shiny as the metal houses that inspired them. In the days before electronically-triggered crossing gates, many railroads kept an employee at busy crossings to stop traffic when a train was coming. The watchman's shanty was not much bigger than a "guard shack," but it would frequently hold a tiny stove to help the watchman keep warm in cold weather. 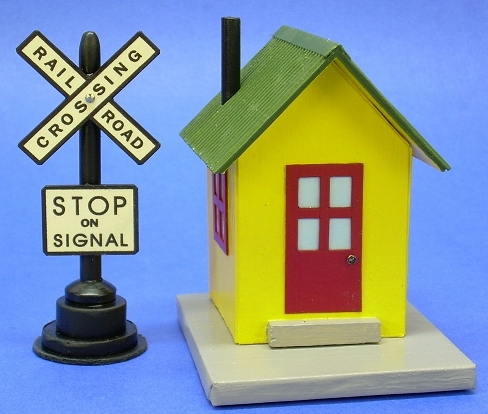 Lionel idealized the watchman along with his shanty in a series of automated products that featured a little blue man popping out of the door waving a lantern every time the train went around the track. 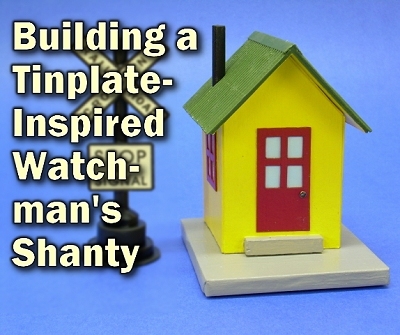 This project avoids the noise and electrical wiring of the solenoid-powered watchman, while retaining the charm of both the original structure and of the tinplate models. 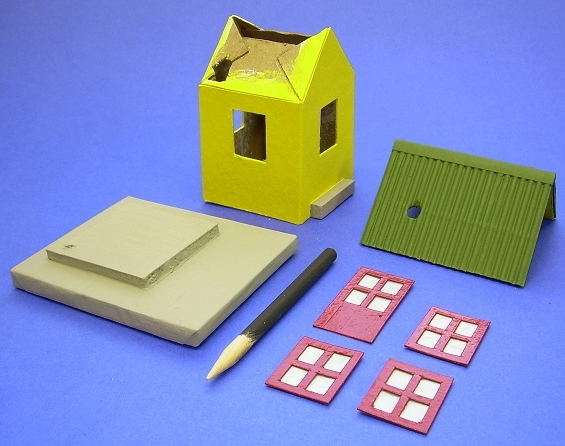 If you've been building our other cardboard houses and related projects, you'll find the steps and materials used to be very familiar. If not, welcome to a fun and growing hobby. 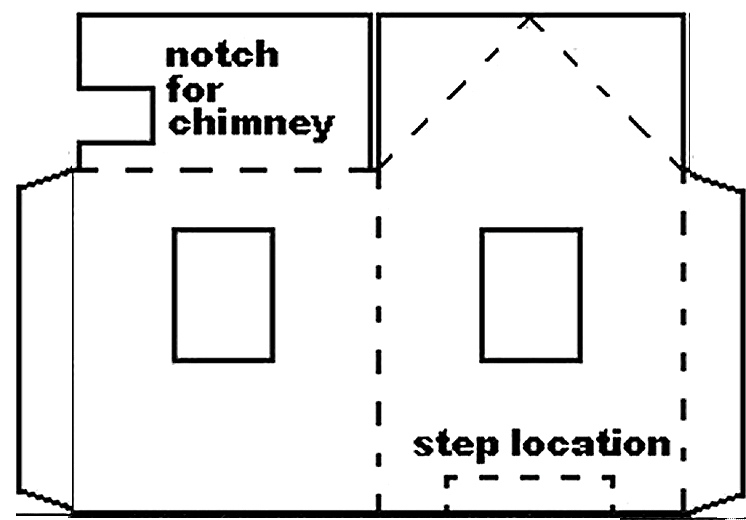 A dowel or cylinder for the chimney. For O scale and smaller, a candy-apply stick will work. For larger scales, consider something larger, like a Bic pen cylinder. 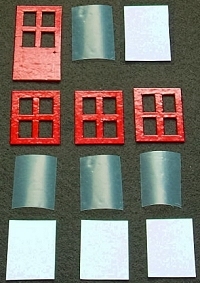 Some clear or translucent material for "glazing" the windows - I used the plastic from a cereal box liner, backed with light blue paper. 1/4-inch x 1 /4-inch x 1 1/4-inch piece of balsa wood or similar material for the front step. Clear acrylic glossy spray to get the shiny "metallic" finish at the end of the project. 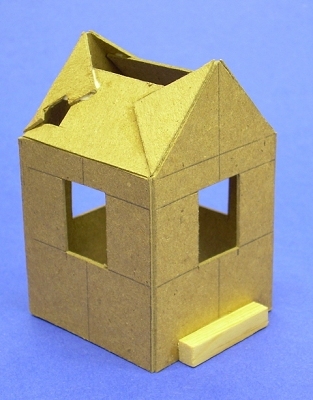 Note: Our article on What You Need to Build Glitterhouses lists other materials and tools that will help you work more quickly and effectively. So if you want your tinplate-inspired projects to look right with your existing equipment, you probably want to do a "mockup" first and compare it with your existing equipment. 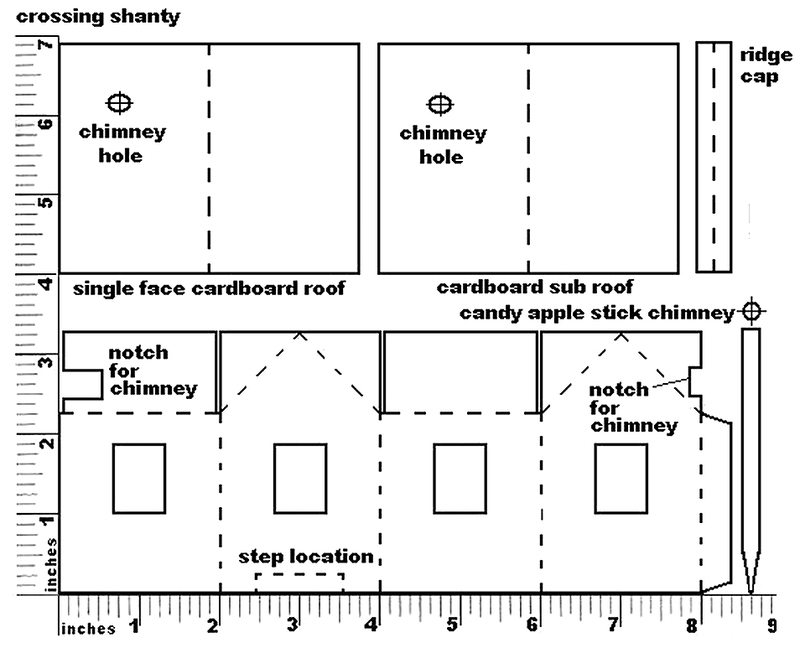 In my case, I made my "mockup" as I was designing the shanty, as you can see to the right. I made it full sized for O scale (1:48), which is actually a larger scale than most of my O-gauge Marx trains. As it turned out, the second building I made in this series was the Lewis Park Station, which is a little smaller in scale than my shanty, but it looks better with my tinplate Marx trains. So if I was doing the shanty over again, I would consider reducing the size by 20%-25%. Paul has provided re-scaled plans that are close to S scale (1:64). This S scale version would be the best to to with Marx trains or with American Flyer S Gauge trains. Paul has also provided plans for a 1:29 shanty to go with Large Scale (garden) trains or antique Standard Gauge trains (such as the earliest Lionel and Ives trains). Whatever scale you think you want, consider doing a mockup first to be sure you've chosen the right size. If nothing else, you can open the .jpg versions and resize them as you print to any scale you need - just make certain you resize all of the plans to the same scale. Standard Gauge/Large Scale Plans (1:29) - recommended for garden trains or the earliest (big) Ives or Lionel trains. Standard Gauge/Large Scale Body pattern. Use this pattern if you can print on legal paper; otherwise use the two patterns below. 1:29 Shanty Body - Which printout you use depends on whether you can print legal paper. 1:29 Shanty Body - Legal paper pdf - Use this printout if you can print legal paper, otherwise use the printouts on the next line. Select the print option, tell it to "auto rotate and center" (or whatever else you need to select to make it go the right way on the paper). Don't select the "scale to page" or "shrink to fit" option unless you need to reduce the size of the printout (see below). Print. When you get your printout, double-check the measurements with a ruler. Note: On some printers, a small portion of the image may disappear at the outside edge of the page. But you can easily "fill in the details" by looking at the jpg versions. If you don't have Adobe Acrobat Reader on your computer or for some reason that doesn't work, you can open the big JPG versions by clicking on the reduced plans above. You will probably have to experiment and tweak the sizes to get them just right, though - that's why the PDF version is more likely to work for you. 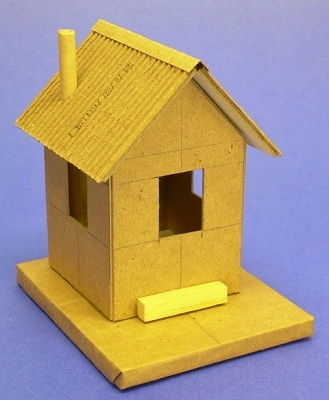 The shanty body and sub-roof should be heavy, single layer cardboard, like the back of a writing tablet. 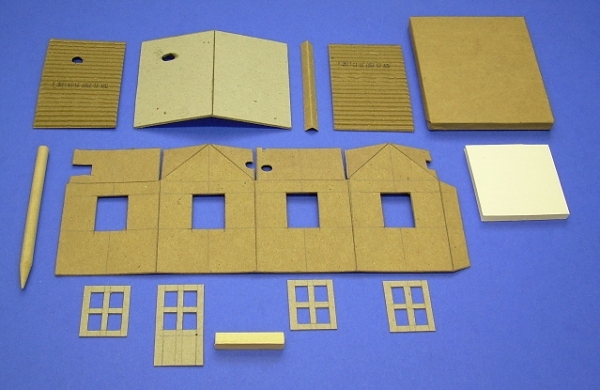 The roof cap, door, and windowframes can be a lighter cardboard, like the cardboard from a cereal box. 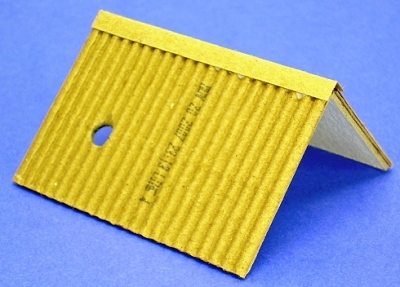 The base can be cut from corrugated cardboard. 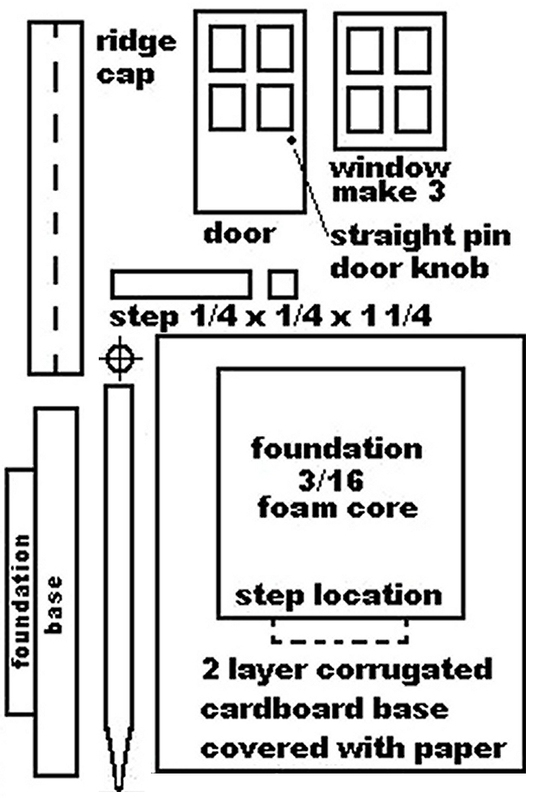 The building foundation should be corrugated cardboard or foam core board. 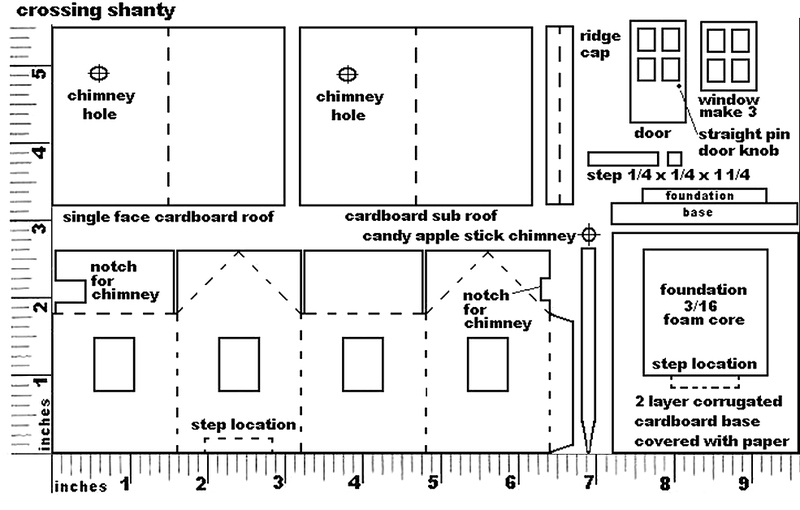 For O or S scale, the chimney can be a candy apple stick or the like. For a larger scale, you may use the shell of a Bic pen or something similar. The base is a rectangular "box" built up from corrugated cardboard. It will also have a "foundation" piece that sits just inside the building's shell to help it stay in place. Note: For more information about building bases, please see our Glitterhouse Bases article. After you have built the base, cut the foundation piece out of corrugated cardboard or foam board and set it loosely on the base. 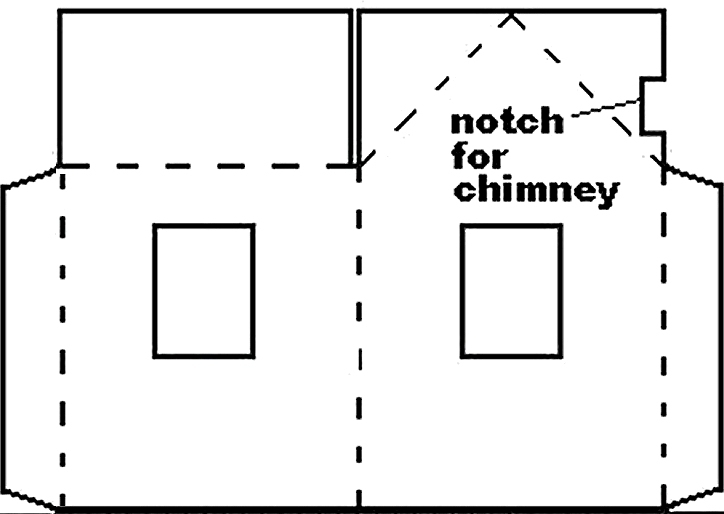 When you get the shanty built, position it over the foundation to make certain it is a secure, but not overly tight fit. Then you may glue the foundation in place. Once you're certain of the fit, prime the base and paint it with several coats of glossy paint in the color of your choice. Industrial gray was the color most often chosen for this kind of base in the tinplate days. Fold the shanty walls where you have scored them and glue the tabs that hold them together. Glue the folds that will support the roof together as well. Be sure to check it every so often in case something has slipped out of place. 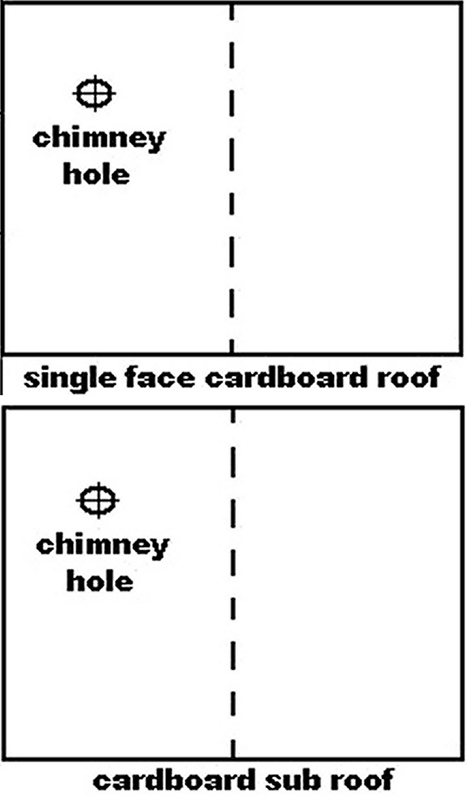 In the photo the right, you can see that I cut a hole through the folded roof pieces for the chimney to pass through. This doesn't have to be an exact cut, since the roof will cover any jaggies. 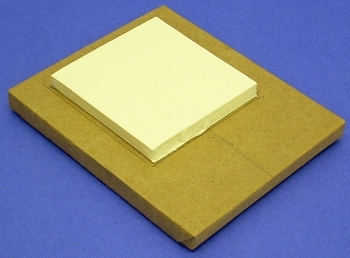 The sub-roof should be a heavy solid cardboard, like the back of a writing tablet. Score the line where the crease will be on the sub-roof, then check the fit on the shanty body. When you are satisfied, score and crease the top layer of the roof as well. Again, check the fit. Glue the roof layers together. You will probably need clothespins and some method to clamp these pieces so they stay folded at the correct angle as the glue dries. Be sure to check it every so often as it dries in case something has slipped out of place. The "ridge" cap is a piece of thin single-layer cardboard. Crease carefully and check the fit. When the two roof layers seem solid, glue the ridge cap on. I used a punch to make the hole for the stove pipe. Do not glue the roof to the body until the instructions say to. You CAN check the fit as you progress by setting it on the body, if you wish. In the photo to the right, the roof, body and base have been set together to check the fit and the overall look, but the pieces are not glued together quite yet. You can use a "test fitting" like this to make certain that the foundation where you need it to be and it is the right size. I used a Xacto knife to cut the door and window from thin cardboard, like the kind on cereal or Kleenex boxes. Then I primed them, painted them with glossy red paint, and let them dry. For the glazing, I cut squares of the translucent plastic from cereal box liners, then I cut squares of light blue paper to put behind them to give them a bluish tinge. Glue around the edges, being careful not to get glue on the part of the glazing that shows through the windows - that will take on a distinctively different color. Prime each component with a flat white undercoat, then, after that has dried thoroughly, paint the top coat in the color of your choice. It can be glossy, to imitate the original tinplate structures. If you don't have something shiny, don't worry too much; you're going to finish this project with a glossy spray topcoate. I glued the door and windows to the shanty first. Then I glued the rest together and admired my work as it dried. When it was completely dry - the next day - I hit it with several light coats of glossy spray. This part is more art than science - if you get the spray on too thin, it looks more satiny than glossy - if you get it too thick, it runs. But you're better building up several light coats than trying to make the building as shiny as a new toy all in one pass. You can see that, when you get to the gluing, painting, and "laquering" stages, there's a lot of "hurry up and wait." That's one reason many people who build this sort of project often work on two or three structures at the same time - you can work on the second house while the glue is setting on the first one, and so on. I'm on the lookout for a little watchman who's the right scale for this building. In the meantime, Paul suggested a "crossbuck" railroad crossing sign, so I did a little R&D, and Paul did some graphics, so we have another project that will dress up any corner of your railroad. Commercial "Plug" - Now that I'm in "retirement," this hobby has become a sort of avocation for me. Several folks have commissioned me to build specific houses for them. I often provide an "artist's conception" to make certain I understand what they want. Sometimes the "artist's conception" needs to be tempered by adjustments to make the house fit in better with the other houses it will be joining, as well as color and accessory changes. But it all starts, quite literally, at the drawing board. Perhaps you had a toy or pasteboard structure when you were young and would like to have a replica made. Or you have an idea for something that's never been done. If you can find a photo or hash out a drawing or anything else to give me some idea of what you're looking for, that can be enough to get started. If you'd like me to help you design and/or build a project for you, or if you have any questions at all, please see my site, LittleGlitterHouses.com for more information.